2017 Featured on NBC's Harry: "Harry Connick, Jr. Eats Boston"
2016 Cooking with Paula Deen "Best Spots with Soups"
"On 27 May 2003, we designated the Union Oyster House as a National Historic Landmark. 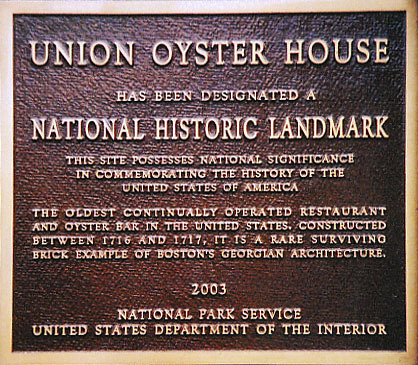 This is a double designation: The Union Oyster House is the oldest continually-operating restaurant and oyster bar in the United States and the oldest standing brick building in Boston's Georgian architecture. To reach this designation has been careful and arduous, through historic records and accounts, through interviews with the owners, brother and sister Joseph A. Milano and Mary Ann Milano-Picardi. The building and restaurant have a remarkable, exciting past. Here was the home of Isaiah Thomas, where he published the Massachusetts Spy from 1771 to 1775. Here, Louis Philippe, later King of France was a guest and taught French to prominent Bostonians. Here was the first use of the toothpick, invented by a Maine family in the timber industry. Famous patrons across the decades have included Senator Daniel Webster, a regular in the 1840s and 1850s, who reportedly drank a tall tumbler of brandy and water with each half dozen oysters. Presidents have dined here: Franklin Roosevelt, John F. Kennedy and William Clinton, as well as governors, athletes and state and screen visitors to Boston. When in Boston, President Kennedy visited the Oyster House nearly every Sunday at noon and ate lobster stew. Preferring the privacy of the upstairs dining room, he dines at booth number 18, which now has a dedication plaque and Senator Edward Kennedy visited the restaurant about once a month. One president worked at the salad bar in total anonymity for a few months during his sabbatical: Jack Coleman, President of Pennsylvania's Haverford College worked to sample one of this country's rigorous lifestyles. Below is a commissioned painting with video of famous politicians who have visited the restaurant. 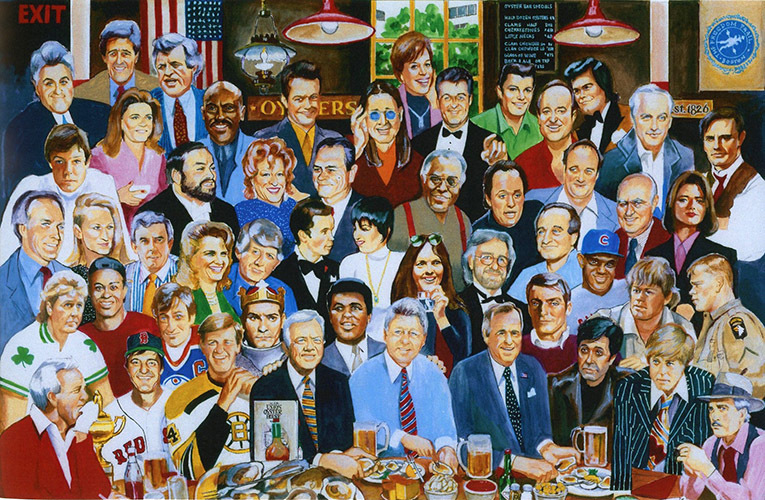 Among other famous patrons: Paul Newman, Steven Spielberg, Robin Williams, Billy Crystal, Sammy Sosa, Larry Bird, Ted Koppel, Dan Rather, Meryl Streep, Robert Redford, Al Pacino, Wayne Newton, Ozzie Osbourne, and the entire Ryder cup Team in 1999. During his visit, Luciano Pavarotti discovered that the group sitting next to his booth were celebrating a birthday, and the renowned singer gave an impromptu happy birthday. In 2003 a commissioned painting was done for the restaurant by Stan Kotzen, seen below. The heritage and present significance have no end. The Union Oyster House has the welcome mat out for statesmen, artists, travelers, inventors, sports and theatre figures." To learn more about the history of the Union Oyster house please visit our History page.